Looking for a distinctive, one-of-a-kind wood table with loads of artisan style and a small price tag? 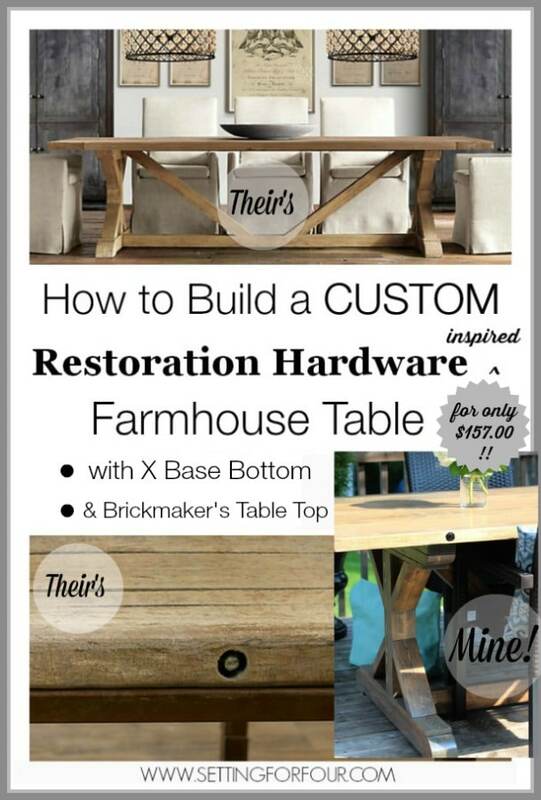 See my latest build: a DIY Restoration Hardware Inspired Farmhouse Wood Table…. 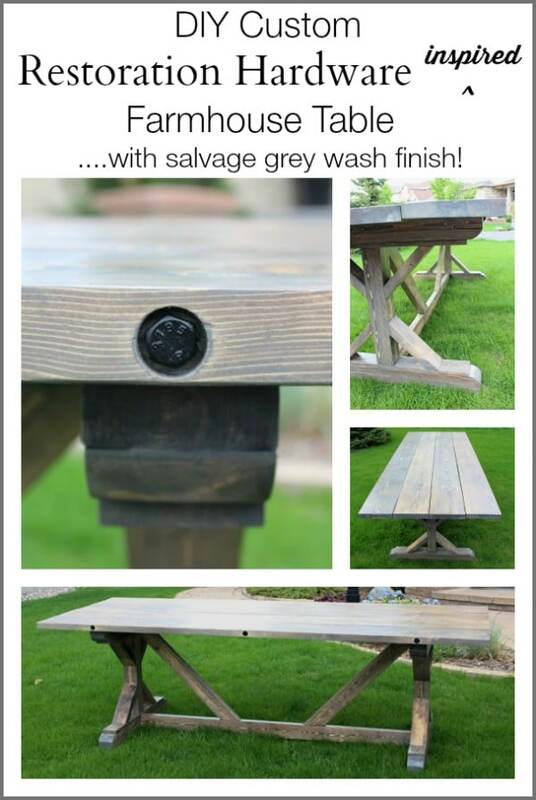 with Salvage Grey Wash Finish and Bolted Plank Top – less than $200.00 to make! I’m so excited to let you know that this table is my own custom design …and I’m sharing the instructions on how it’s made with you today! I combined two popular RH table styles, the rectangular X-base Table and the Brickmaker’s Table, to come up with this distinctive innovative design: an X-base bottom with an industrial bolted plank table top! Awesome part? It cost just $157.00 total!!!! WOW! This is my absolutely, most favorite DIY build I have made! I’m honestly in love with everything about this gorgeous dining table! Including: the customized design style (x- base farmhouse style with bolted planks on top), the size (8 feet long! ), the wood finish (trendy sun-bleached grey wash), the combination of two popular RH looks (X Based Wood Table and the Brickmaker’s Table)….and the best part: the price tag to make it! Our price: only $157.00 Total!!!! We used these these plans to assemble the table (with the addition of our own design touch: adding hex head lag bolts to the table top planks! 1. First step is to measure and cut the wood with the miter saw into the sizes outlined in the Plans. Use the square and pencil to draw out the miter lines to be cut. 2. Sand each piece smooth using the sandpaper. Start with the belt sander and 80 Grit sandpaper for the ‘rough’ initial sanding. Use 120 Grit to removes scratches in the wood. End with the orbital sander and 220 Grit sandpaper for the final ‘fine finish’ sanding. This sandpaper is so effective, it sanded the wood beautifully and has a longer sheet life than conventional sandpaper! 3. 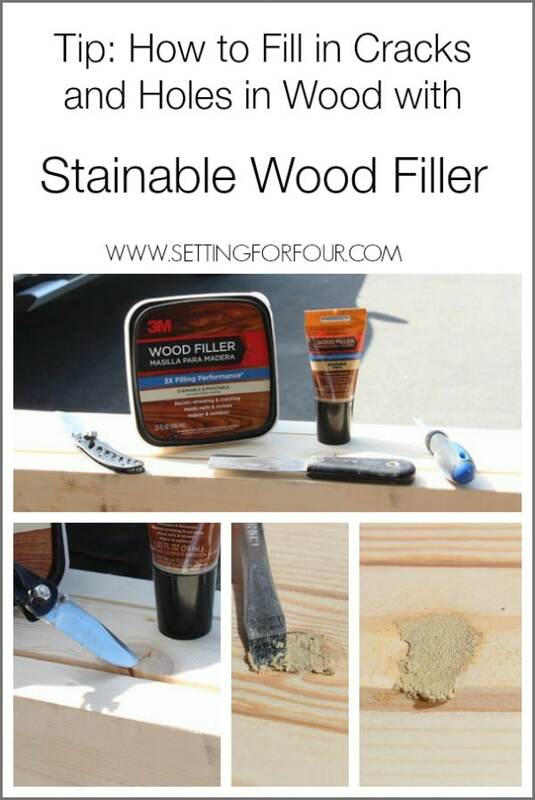 Tip: How to Fill in Cracks and Holes in Wood with Stainable Wood Filler – Fill in all holes, knots and cracks with Wood Filler – this wood filler applies easily and is stainable so it will blend in with the wood after staining! Use a putty knife to apply wood filler to large, shallow holes and cracks or a screwdriver for smaller holes. Use a knife to apply the wood filler into deep cracks. 4. Sand all of these wood filled areas smooth using 220 Grit sandpaper. 5. Assemble pieces according to the Ana White Plans. 6. 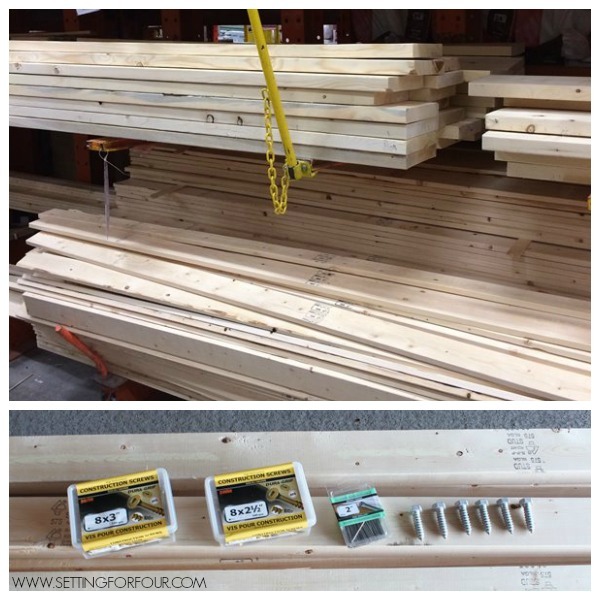 Use wood clamps and exterior wood glue when attaching wood pieces together. 7. Drilling Tip: When drilling, use the Painter’s Tape to mark holes to be drilled and reduce splintering from drilling. This painters tape worked great for this wood finishing trick and it left no adhesive on the wood when we removed the tape! 8. 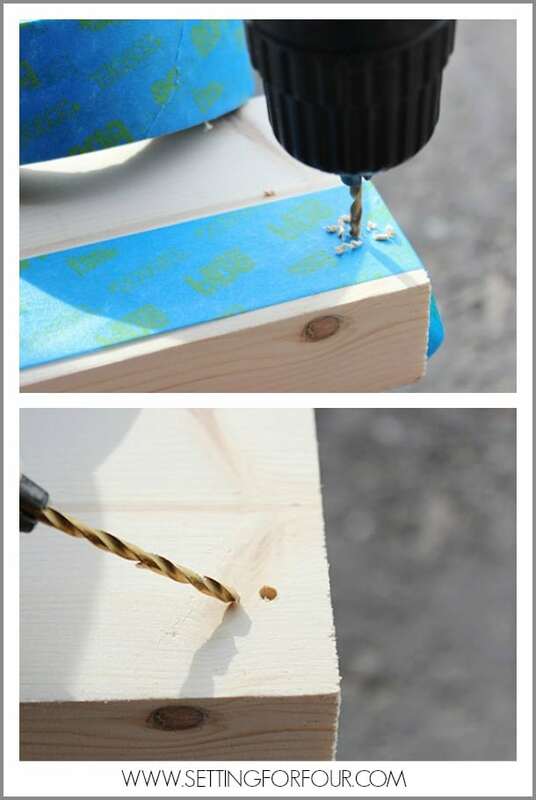 Use the Cordless Drill to pre-drill screw holes. 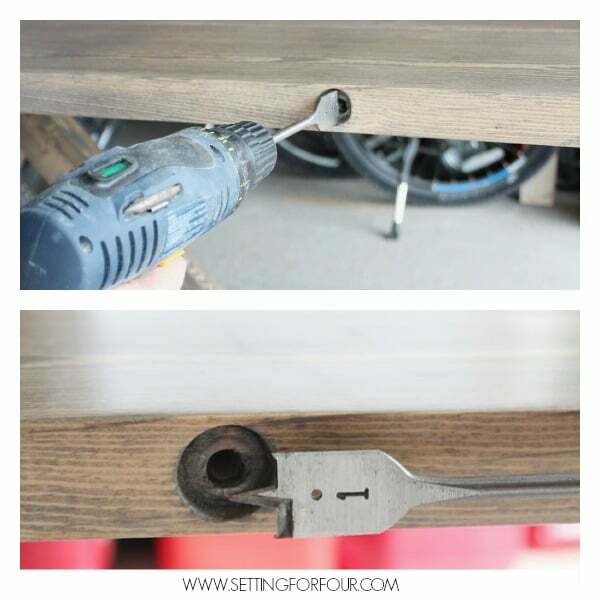 Use the Electric Drill and the 5/32 drill bit to drive in screws. Tighten screws if necessary with the Robertson screwdriver. 11. Apply one coat of Pre-Stain Wood Conditioner according to instructions listed on can. Let Dry. 12. 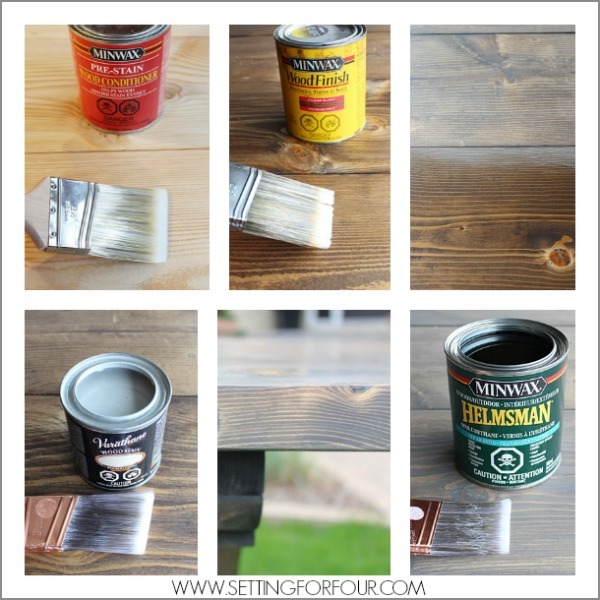 Apply one coat of Dark Walnut Wood Finish Stain according to instructions listed on can. Let Dry. 13. 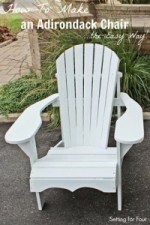 Apply one coat of Fast Dry Sunbleached Wood Stain according to instructions listed on can. Let final coat dry. 14. Apply 3 coats of Helmsman Spar Urethane Exterior Clear Satin Protective Finish according to instructions on can. Let fully dry. 15. Spray paint hex head lug nuts flat black. (You only have to paint the heads). Let dry. 16. Screw in the hex head Lag Bolts into sides of table top using the 3/4″ Socket + Wrench. And this is the finished built X farmhouse table! I’m in love with how handsome and distinctive it is with it’s artisan look! I love the extra industrial detail that the hex head lag bolts add! It’s generous size will allow us to hold some large outdoor dinner parties this summer! …and of course I love the price to make, only $157.00 ! It’s so rewarding to make your own furniture for so little cost! 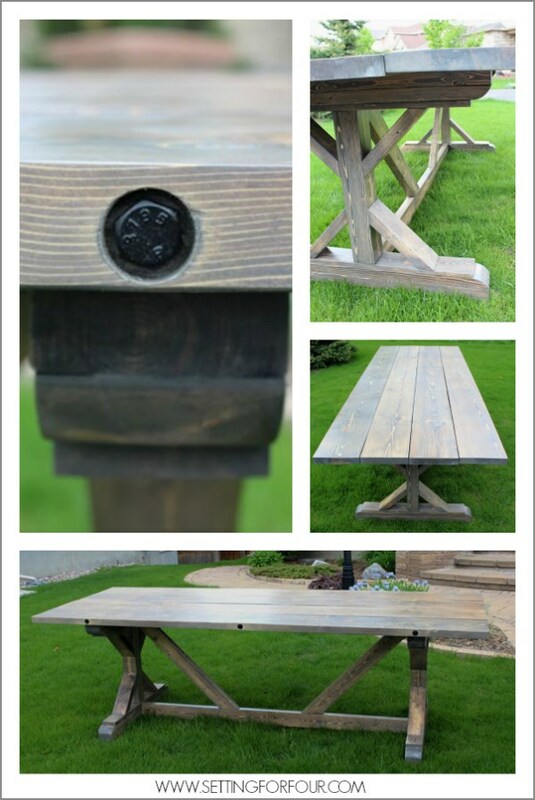 I can’t wait to enjoy summer meals and refreshing drinks, al fresco, on our deck with our salvage grey wash Farmhouse Table! Have you ever made a table for your home? If not, let me encourage you to do it!!! If I can do it – so can you!!! 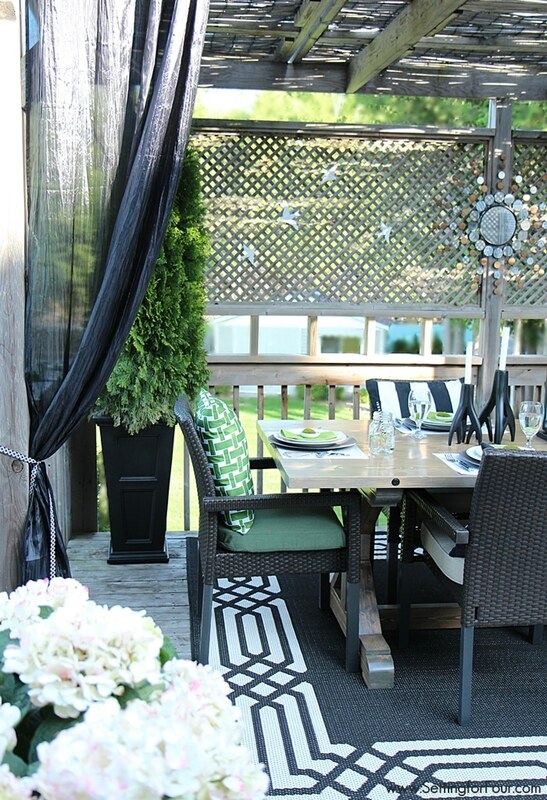 Summer Deck Decor Resource List to get the look! Wow, Heather! This table is gorgeous! This is a great idea! I wish I could do it. Thanks Cindy!!! I’m soooooo happy with how it turned out – our family has been enjoying it a lot this summer with dinners on our deck!! How did you get around the boards being twisted for the tabletop? Hi Joe – we didn’t use any boards that were twisted. Thanks so much Katie for your compliments! I can’t wait to make another one for our kitchen! So beautiful!!! I need my husband to make me one of these!! I’m so glad you like it Selene! Please send me a photo of your table if you decide to make one – I know you’ll love it too! 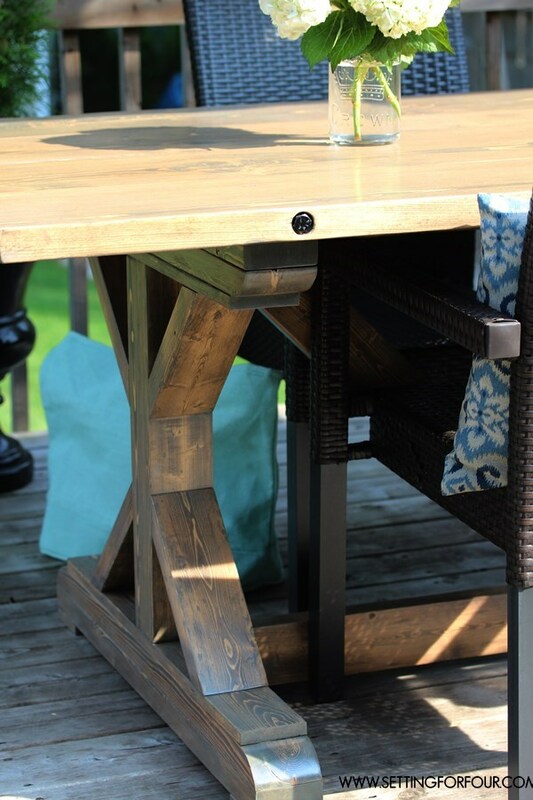 I adore this style of farmhouse table… looks like yours turned out beautifully! We had one custom built for a recent client cottage project and they love it! Now , if I can find some time… I will see if we can make one for ourselves!! Beautiful table Heather! Thanks for the inspiration and great tips from 3M. Thanks Meegan for your compliments! 3M DIY has awesome tips – I agree! Absolutely gorgeous table Heather! Love everything about it! You make me want to build one myself! Oh Shanna!! Your sweet compliments mean so much to me!! Thanks so much!! You know I had this idea in my head…my design of the combination of those two popular Restoration Hardware Table styles and it’s so rewarding to see my vision actually become reality! If you make one please send me a picture of it!! Love the color stain you chose…so pretty!! I’m in love with all things grey right now Meredith – this salvage grey wash stain is just gorgeous and gives the table real character! Thanks Heather! Great name by the way! 😉 We are pretty wowed by it as well!! It’s a great size for entertaining and I just love the detail of the x base and the lag bolts! thx for how to’s also ,pinning this. Love it! I want one! The color is perfect and the price is too! Isn’t the price to make it incredible?? I’m glad you like the grey washed finish as much as I do! Yay – go for it Fotini! Oh thanks for pinning it and featuring it too Robin! I’m so glad you love it as much as we do!! This is absolutely gorgeous! 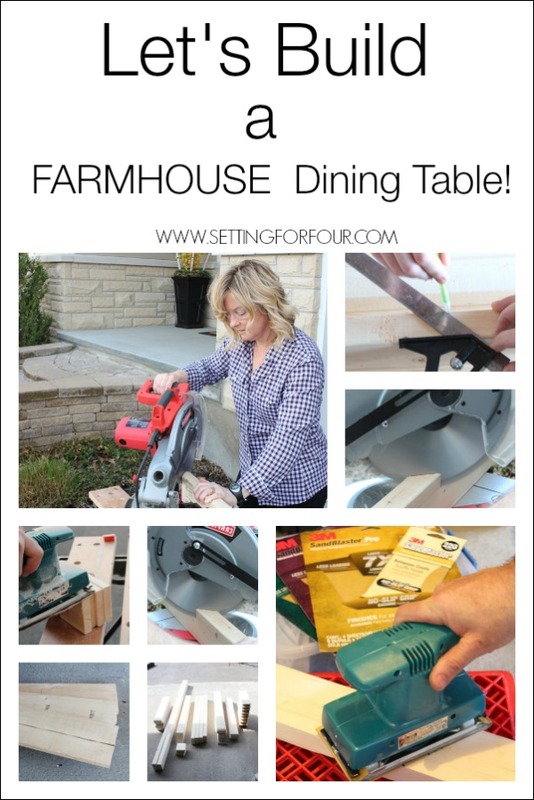 I am actually wishing I needed a new dining room table right now! 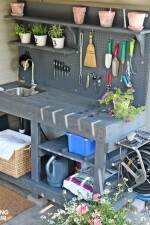 LOL – Make one for your outdoor dining space!!! Thanks for your lovely comments Sarah!! I am so in love with this table! You are so talented Heather! Thanks for sharing at the Twirl & Take a Bow Party. Have a great weekend! Love, love, LOVE this Heather!!! Great job! Thanks Maryann – we’ve had lots of great meals on it with family and friends! Turned out beautiful. Love the stain! Thanks Pauline – the stain is so pretty! I love the color grey! Thanks Marissa – I’m so happy with how it turned out too!! Wow what a great knock off. You nailed it. The Gray wash is perfect. Oh thanks Vidya – glad you like my design! Love this!! 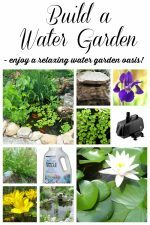 This is such a great, and much more affordable, version! It sure is!! At $157 – it’s much nicer on the wallet! Thanks Christy – we do love it! Wow – that is fantastic. Great job!! I want one!! Pinned! So beautiful! That looks like something you’d pay a lot of money for! Thanks Amy – I’m glad you think it has an expensive look! I love creating things that look expensive but are easy on the wallet! Your table looks amazing. I love the stain! This table is gorgeous! I absolutely love the color. I trialed several combinations of stain before I found this perfect blend of grey over the dark walnut stain – so glad you like it Shannah! Awesome idea to ask your FIL to make it!! You will LOVE it! Love the grey white wash! Looks better than the expensive one! Oh thanks Julie – you just made my day with that lovely compliment!!! Thanks Teri for your awesomely supportive comments!! Please send me a photo of your table! Absolutely gorgeous!!!! I need to make one for a friend (we don’t have the room) since they need a table. Now I need to find that Varathane stain (here in Canada) and get it done! How sweet of you to want to make one for your friend!!! She would love to get one I’m sure!!! I absolutely love this table. We are going to start building soon but had a question… How exactly did you attach the top of the table to the legs? Hi Amelia – the instructions for that step are in the Ana White plans which I used and linked to in my post. Hope that helps! Have fun making one! Hi Kathryn – there isn’t a download, you can just right click where the instructions are and print them out…. 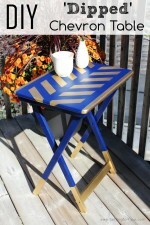 and the basic table design is here http://ana-white.com/2012/06/plans/fancy-x-farmhouse-table. I hope that helps! Thank you Megan – we have really enjoyed using it! This table is so beautiful! I’ve decided to tackle this and give my woodworking skills a try. One question. I want to use this as an outdoor table. I see in the one photo the boards at the end don’t look even. Is this something that can’t be left outside. I’m wondering if this lets the wood expand and contract enough for total outdoor usage. What an amazing project Heather. I’m showing this to Bobby!!! Great job! I’m itching to make this but I have a large family. How many does this table comfortably seat? And how well does it clean up? I have a lot of little people under 9 yrs old. Thanks bunches! I adore your stain! Any tips on how to perfect my own! I’ve been trying this combination and can’t quite seem to nail it yet! Hi Abby – you’re probably going to see a bit of a difference depending on the graining of your wood….I suggest just keep trying to work with the character of your wood until you like the color! I know that’s not an ‘exact’ tip, but that’s what I did with our wood! I’m so thrilled you are trying it and don’t give up!! Thanks for visiting!! Could you tell me best stain color to use for a ceiling and knee wall on a screened in porch. WE are thinking of using a tile that looks very vintage.. Blendart Natural. It has some browns and white. I can later change kneewall color but not the ceiling so it has to be something that isn’t just a fad. love your table. I would keep the ceiling a knee wall a color that matches the white color in the tile so that the beautiful tile pops. A brown stain might clash and overpower the tile. This will let you to add any accent color of decor/pillows/ flowers ect and will allow you to switch up decor colors easily. Hope that helps! Do you have any tips or tricks for the beveled look on the feet and under the top? I noticed Whitney just mirrored hers, but I love the beveled edge but not sure how to do it. Hi Amy – sorry I’m not sure what you mean? I LOVE THIS!! My husband just built a farmhouse table but we aren’t sure how to stain and protect it for outdoor use? Is this more or less weather proof? We were going to get a cover for non-summer months, but I wondered if yours is used outdoors in the elements. Hi Jen! Yes – the stain and sealer that we used makes it outdoor weatherproof! We leave ours outside! 🙂 Enjoy your table! Hi Jen!! Yes – it’s held up to outdoor weather because of the top coat protector that’s put on top as a final coat to seal and protect. It’s the one listed in the instructions!